I was listening to a conversation between some folks the other day. Smart people. I found myself making mental notes of phrases, acronyms, and other terms that just seemed overly complicated. I’m watching facial expressions and body language. Looking for signs of any engagement, which is impossible if you’re unclear what’s being communicated. At some point I know I broke out in a smile. I was trying to suppress it somewhat. I was thinking of some old books by famed newsman Edwin Newman. He was a language guy, really bent on clear communication. I’m sure his books are out of print, but they’re worth finding. I’ve got my copies of Strictly Speaking: Will America be the Death of English? and A Civil Tongue. I’m watching, listening, but thinking of what Edwin Newman would say about all this jargon and jibberish. That’s when I smiled. Some time ago I was describing a person to a friend of mine as “word proud.” I said, “You know the type. He’ll use 200 words when 20 would do.” Some weeks later, after an encounter with this person I had accurately described, my buddy called. “Boy, did you have that right.” He went on to describe a rambling monologue delivered by said word proud guy. Business-speak exists in every industry. We have terms that we’re familiar with that those outside our industry may not be. Some of these are quite meaningful. To us. But there’s another form of business-speak that is vague, unclear and confusing. The title of the article is The Most Annoying, Pretentious And Useless Business Jargon. The article lists a few but links you to a more extensive list of 45 annoying, pretentious and useless words or phrases. I’ve concluded that mostly this problem stems from people wanting to appear smart. Or smarter. Turn that goal on its head. Better yet, lose that goal altogether. Instead, adopt a better goal. To be understood. And to understand. I don’t remember when I first heard the term “tiger team,” but I do remember the situation. I looked around the room, figuring I may be the only person without a clue what it meant, so I asked, “What’s a tiger team?” The earth didn’t stop rotating. The person who used the term appeared to struggle a bit to help me understand. Finally, he said, “Well, it’s a just a smaller group of people assigned to tackle a problem.” I was far more embarrassed for him than myself…since the definition didn’t just trip off his tongue easily. I joked with the room, “I started to just Google it, but figured I’d ask.” Later I did Google it. People shouldn’t have to Google words or phrases you use in order to understand. 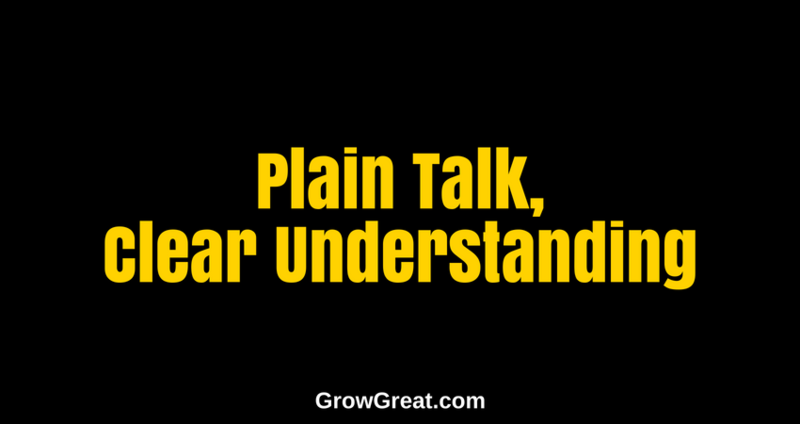 Who do we think we’re going to impress when we speak in ways that are hard to understand? It reminds me of the preacher who would hold forth for over an hour each sermon. The congregation had no idea what he had preached, but after services most would comment, “He sure is smart. I wasn’t able to follow much of that.” To which an old-timer replied, “Everybody thinks muddy water is deep.” True story. And it’s a true adage among some. I don’t understand what he’s talking about so he must be smarter than me. Is that what we’re going for? Convince me of the profit in that strategy! Listen, I realize I’m in Dallas, Texas and I know our clocks don’t operate using New York seconds, but man alive, can we just say what we mean and mean what we say? I speak with people every week from all over the world. Folks who are more educated than me. Folks who have subject matter expertise I don’t have. People who have very different experiences than I’ve had. It doesn’t mean me inferior to them. Nor does it make me superior. What it does do is compel me to work harder to make sure I can understand them (and I’m not talking about their ability to speak English), and to make sure I can be understood. If we lack mutual understanding, then we’ve got big, big problems. Sometimes in our businesses, we’ve got big, big problems for the same reason. If you were to list all the jibberish business jargon that has crept into your organization…how long would that list be? Forbes’ list is up to 45, but it’s also 6 years old. But in that same year, the same magazine – Forbes – published another article entitled, 89 Business Cliches That Will Get Any MBA Promoted And Make Them Totally Useless. I confess I didn’t compare the two lists. I’m not that interested. But plain speech isn’t hard for me. Don’t make it hard on yourself. Or the people with whom you’re communicating. It’s like telling a joke. If you must explain it, it ain’t funny. If people have to ask you to explain what you mean, then you failed. Work on it. It slows things down. And speed it your friend. Business jibberish is the enemy. The smart folks are unimpressed. The rest of us are just plain confused. Next post: Small Business Leadership Daily Brief: June 14, 2018 – Culture, Make Sure Yours Isn’t The Cultivation Of Bacteria!